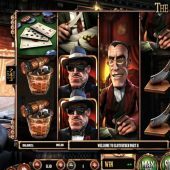 The Slotfather Part 2 slot as you can guess by the number '2' is a sequel in the style of the Godfather films it parodies. 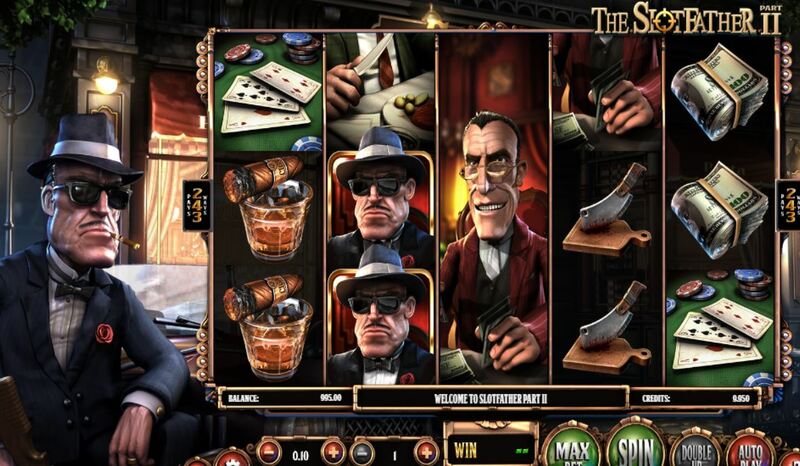 The original Slotfather game, furnished like this one with the glossy photograph-style graphics that are the trademark of Betsoft slots, was a successful game. So will this 243-way sequel put out a hit on us too? The images are far more aggressive than the genteel Novomatic slot Chicago which has the same theme, the characters you would certainly want to avoid or at least stay on the right side of. We have the normal 5 reels and 3 rows that come with a 243-way game and the background is a sleazy dive-bar with jazz music of the era played in the background and as the reels spin. The symbols are stacked either 1, 2 or 3 rows high except for the 3 gangsters we are reacquainted with which are Frankie, Fat Tony and Snake Eyed Sammy - these are always fully stacked on the reels as they trigger a bonus for 3 full stacks in view as we will see soon. Wilds only appear on reels 2 and 4 but can be stacked and the Mafia Don in the dark glasses is the highest-paying icon at 15x bet for 5-of-a-kind followed by the playing cards at 10x down to the paintings of the Leaning Tower of Pisa at 3x stake. You need 20 coins for a spin which is quite reasonable for a 243-way game. When 3 stacked Frankie, Sammy or Tony appear in view you are awarded their respective protection money collection feature. Should 2 appear you will get a respin with them held; unlike the real Mafia you will get a second chance to get the job done! Either way if you get 3 you can pick various items in the back rooms of businesses, hopefully collecting as much cash as possible. Frankie is the highest-risk one, as he doesn't always collect when he gets carried away with his work, but when he does it's big! Snake Eyes Sammy isn't too cautious but not a huge risk taker so usually collects a decent sum. Fat Tony is slow and cautious and will always want to come back with some dough, even if it isn't a huge amount. If they come in on reels 1, 2 and 3 you get pays too, 0.25x bet for 3 for example which would be multiplied by 243 paying a decent 60.75x bet before you start the feature. One symbol not yet mentioned it the Cash Truck which naturally these guys want to rob for its contents. This robbery requires you to get 3 or more anywhere in view. Should you stop these 3 Trucks then you will get either 8, 12 or 20 retriggerable free spins for 3, 4 or 5 Trucks respectively. You will get 3 rewards for your audacious heist - Wilds now on reels 2 to 5 instead of just 2 and 4, a 2x multiplier on all pays and when the spins are over you will open a briefcase and be given some more cash. The proceeds of crime can be lucrative!